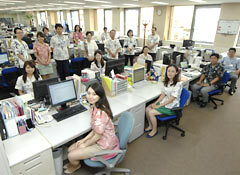 Three thousand employees of JFE Engineering have begun wearing kariyushi shirts in the company’s offices from July. Twelve branches nationwide from Hokkaido to Kyushu, including the main office at Yokohama in Kanagawa Prefecture, and 12 other companies in the group are using the shirts. In order to save energy and improve efficiency, this April the company ordered about 10,000 shirts from Okinawan companies. The Okinawa Clothing Sewing and Manufacturing Industrial Association said that they had never received such a large order. The association expects that further orders from energy-conscious companies will allow them to expand their business to outside Okinawa. According to JFE, at a get-together for board members and younger employees, the employees suggested that “Kariyushi shirts are functional and allow the wearer to express their individuality.” They added that it is Okinawan formal dress in summer. With this the company adopted the idea. Chief of Public Relations Masaya Hirotsune suggested that in the wake of the Great East Japan Earthquake, companies need to work on conserving energy, including electricity. He said, “Unlike the polo shirts of Cool Biz, many people see the kariyushi as formal wear and suitable for a business setting.” He also said that employees have been enjoying wearing kariyushi.